In the first published book of Pope Francis, “On Heaven and Earth: Pope Francis on Faith, Family and the Church in the Twenty-First Century”, an entire chapter is dedicated to a discussion between then Cardinal Bergoglio and the Rabbi Abraham Skorka on communism, particularly Karl Marx. “Religion is...the opium of the people”. For Karl Marx, religion is nothing but an illusion, a “creation” by man in order to obtain an “illusory happiness”. For Marx, the abolition of religion is needed in order for man to attain “real happiness”. The Communist Manifesto written by Marx led to the rise of atheistic communism, determined to crush all forms of religion and belief in God - An atheistic ideology, spread throughout the world by the Soviet Empire. And despite the dissolution of the Soviet Union in 1991, Karl Marx’s enduring communist legacy lives on in modern-day communist China - the world’s new superpower. An entire nation of a billion people living in a society that has killed all belief in God. Strangely, the chapter on communism in the book of Pope Francis is not a critique of the ill effects that Marx’s philosophy has brought to modern society - the scourge of communism. In fact, both then Cardinal Bergoglio and Skorka seem to justify Karl Marx and re-emphasize his philosophy all throughout the chapter. Skorka says that Marx wrote what he wrote (“religion is the opium of the masses”) in response to religious institutions that were deficient. Referring to Karl Marx and Nietzche (who said that “God is dead”), Skorka says that “they were criticizing religious institutions which were lacking in spirituality.” (p. 151). What is most surprising is that Cardinal Bergoglio echoes the sentiments of Skorka in seemingly justifying Marx - even going to the extent of re-using Marx’s famous “opium” quote in a couple of instances in the chapter: “If a person tolerates things without fighting for his rights, hoping for paradise, he is indeed under the effects of opium.” (p. 153). Isn’t it that because of Karl Marx, an entire generation of billions of people (Soviet Union, China) have essentially become atheistic societies? It is inconceivable how we can even begin to justify the main “author” of communism - the author of a “work” that has nearly led the world to the brink of nuclear war, and has led to billions of people into believing that there is no God. Paradise Does Not Really Matter? The entire point of Marx was that Paradise - eternal life in union with God - does not really matter. In fact, for Marx, it is a distraction, it is an “opium” that takes our attention away from what is truly important, at least for Marx - the here and now. Attaining heaven is not our primary goal in life - what is important is this earth. God does not matter - work hard in this world so that you can eat, drink and be merry...in this world. One cannot help but notice the parallel between Marx’s above line of thinking, with what Cardinal Bergolio has said in the book regarding Paradise: “...one cannot exempt oneself from progressing by using paradise as an excuse. One has to fight for progress in every area: moral, scientific, educational and labor. We need to fight to keep from being drugged with opium.” (p. 153). Skorka agrees with this same emphasis on the “here and now” - living life to the full in the earth, at the expense of Paradise: “Like the book of Psalms says, ‘The highest heavens belong to the Lord, but the Earth he has given to mankind...” (p. 153). Further on, Skorka says: “It is not right to make sacrifices during our earthly lives for the sake of the world to come.” (p. 155). But isn’t it that all the martyrs of Christianity did exactly that - sacrifice their entire earthly life for the sake of the world to come? Through Marx’s philosophy, billions of people currently live their lives believing that the only point of human life is this earth - that there is no God. Through Marx, an entire atheistic communist empire was born - bringing humanity to the brink of extinction. Prophecies Being Fulfilled In Front of Our Very Eyes? Why, then, does Skorka and the future Pope Francis spend an entire chapter in the first, published papal book justifying Marx - even going to the extent of quoting him and re-emphasizing his ideas? 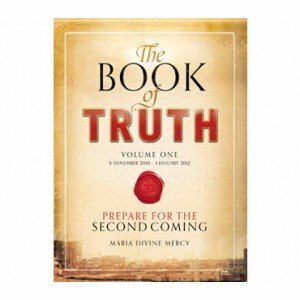 Perhaps, the answer lies in a series of revelations and prophecies given to an Irish seer, Maria Divine Mercy, to whom Jesus gave the stunning prophecy that Pope Benedict XVI is the last true pope on earth: http://bit.ly/18ODWic. In fact, the departure of Pope Benedict XVI from his office on February 11, 2013, was prophesied exactly a year before, in a message dated February 11, 2012: http://bit.ly/18aj4Cu. For a critical analysis and review of these prophecies and messages given to Maria Divine Mercy, we refer the reader to this article: http://bit.ly/1acNu4s. Click here to return from Pope Francis to Catholic Opinion.